My name is Amber and I’m pregnant. Now that I’ve stopped stressing about telling people, I’m ready to start preparing for baby. This, as it turns out, is a lot more stressful. There are an abundance of websites dedicated to pregnancy and parenthood. One only has to have an internet connection, a lot of time, and a firm grip on their sanity to find information and, as a librarian, research comes easily to me. On top of that, I am lucky, because my sister recently had a baby and we are able to share tips and advice amongst ourselves, but we just don’t know it all…or most of it, really. She is already an amazing mother, but she’s always willing to learn a trick or two to make things easier (or cheaper). We decided to start with an easy one: what do you put in your diaper bag? It seems a simple query but, alas, not so. An (admittedly brief) Internet search of diaper bag recommendations offers a slew of suggestions that read more like advertising spreads than real world advice. These bloggers have a suspicion that, not unlike our purses (those magical Mary Poppinsesque bags that are home to flat head screwdrivers and single serve microwave popcorn sachets as well as the traditional wallet and keys), some essential diaper bag contents are unique to the individual. 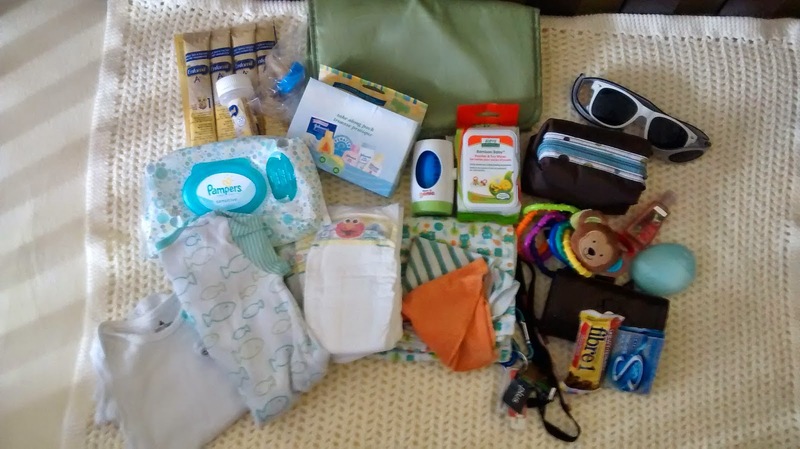 So, in the interest of due diligence, we’re taking it to the people: what is in YOUR diaper bag? Every Monday, we will ask one mommy to bare it all, emptying her diaper bag and telling us what she’s really packing. This way we will finally figure out what truly is a must have, what is worth the extra money, and … what is THAT doing in there? Never ones to get only one foot wet at a time (unless the water is unbearably cold) we thought, hey, if we’re going to do this whole research into the secret diaper bags of the Canadian woman thing, we might as well delve a little deeper. From “Battle of the Baby Products”, to “If It Ain’t Broke… (How Our Mothers and Their Mothers Used to Do it)” with some baby budgeting and mommy fitness thrown in for good measure, we’re setting out to expose—and then celebrate—this whole crazy motherhood thing. For our inaugural post, we’ll take a look at Seana, my co-blogger’s diaper bag. Fair is fair: we’ll show you ours if you show us yours. Take it away, sis! 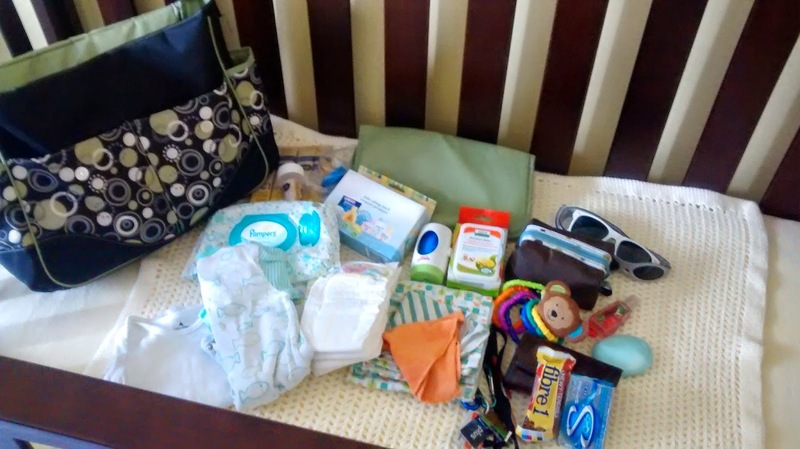 Most Important Thing in Your Diaper Bag: Baby wipes! Not just for the bum, I've used these for coffee stains, spit up, random sticky residue on shared toys, and so much more. If you think one of those cute 20-wipe dispensers are enough for an outing—think again. Pampers makes a great 64 count travel pack that will last me anywhere from one to several weeks. Buy a 3 pack so you have a spare when your pack starts to get low. Basic Save: Wash cloths - sure it's cute to have Disney themed cloths to match your child's every outfit, but these things get burnt out. They get lost, stained, and covered in all matter of baby grossness. Save here and buy ‘em 3 for a buck at the dollar store, or don't even bother! Baby wipes and a good receiving blanket will serve you just as well. Essential Splurge: Hand products! Okay, I'm cheating here and proclaiming my love for both my hand sanitizer and my moisturizing cream. Although I knew I'd be washing my hands more, “more” is the understatement of the century. Do yourself a favour and treat yourself to a sweet smelling cream you'll want to wear. Nothing too greasy or hard to open. I love my EOS in mint. Best Preparedness Advice: Check before you leave. Who's to say your husband didn't lazily take the spare pacifier out of the bag rather than running upstairs. And didn't you tell yourself at the library that you were cutting it close with only 2 diapers? An ounce of prevention is worth not having a pound of poop in the only onesie you brought with you! Bag Contents (L to R) : Baby formula (both ready-to-serve and in case of emergency powder), a baby essential travel kit (powder, bum cream, head-to-toe wash and baby lotion), a travel diaper genie, toy/ pacifier wipes, emergency kit (complete with baby Tylenol, a thermometer, nail clippers, and that strange nose aspirator contraption), sun glasses for mommy and baby, travel wipes, a onesie, footsie pajamas, diapers, receiving blankets, wash cloths, keys with a carabineer for access, baby toys (rings and a rattle), my hand products (anti-bacterial and moisturizer), wallet, snack, and gum!